We’d love your help. 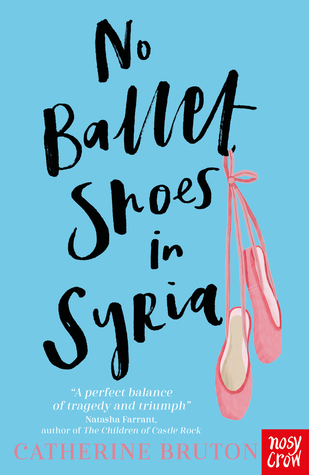 Let us know what’s wrong with this preview of No Ballet Shoes in Syria by Catherine Bruton. Aya is eleven years old and has just arrived in Britain with her mum and baby brother, seeking asylum from war in Syria. But at the same time, Aya and her family must fight to be allowed to Aya is eleven years old and has just arrived in Britain with her mum and baby brother, seeking asylum from war in Syria. But at the same time, Aya and her family must fight to be allowed to remain in the country, to make a home for themselves, and to find Aya’s father – separated from the rest of the family during the journey from Syria. With beautiful, captivating writing, wonderfully authentic ballet detail, and an important message championing the rights of refugees, this is classic storytelling – filled with warmth, hope and humanity. To ask other readers questions about No Ballet Shoes in Syria, please sign up. In her introduction to this, Bruton name-checks some of the best dance stories out there - the Sadlers Wells books by the wonderful Lorna Hill; Ballet Shoes by Noel Streatfeild; and The Swish of the Curtain by Pamela Brown. It's a small thing, but incredibly important as it means that she knows her stuff. These are totemic books, in a perenially popular genre of children's literature, and I think that No Ballet Shoes In Syria more than stands up to them. In fact, it's out in May and I'm telling you about it now because I think it's great. It made me cry, and it made me smile, and it feels like one of those quietly classic stories that British children's literature does so utterly well. It's full of a lot of heart this, not in the least with the representation of Aya. She's a powerful, brave character and the impact of her experience is never far from her. It's no easy thing to write somebody suffering from trauma, let alone to render that in such a beautiful, under-stated and kind manner, but Bruton manages it extremely well. The narrative engages in a series of flashbacks, talking about her life in Syria and the slow erosion of this by war, and the contrast is starkly rendered at some points. I was particularly moved by the points where the relative privilege and comfort of Aya's new life in Britain triggered some painful flashbacks for her. It's also important to note that this is a book that knows its stuff; the distinction between a refugee and an asylum seeker is carefully made, and the historic parallels of Aya's journey are sensitively and movingly explored. This is a good book. It's honest, kind, heartbreaking and really rather utterly lovely. I absolutely loved this book. It tells the story of eleven-year-old Aya who is seeking asylum in Manchester with her mother and brother. An incredibly moving and important story about war, survival, friendship and the power of dance. I finished it late last night in a mess of tears, heartbreak & joy. One that will stay with me for a long time. I feel privileged to have read this beautiful book -one that is destined to become a classic, like the books that inspired it, When Hitler Stole Pink Rabbit and the Sadler's Wells series. The story follows Aya as she attempts to help her mother and younger brother negotiate the vagaries and difficulties of life as an asylum seeker. They have had a long, hard journey from their home in Syria in order to reach the safety of England, but it is dtill unsure if they will be able to stay or not. This bo I feel privileged to have read this beautiful book -one that is destined to become a classic, like the books that inspired it, When Hitler Stole Pink Rabbit and the Sadler's Wells series. This book gripped me from the first page, with each and every character brought to life in just a few words. From the people she meets in the commhnity centre, to those along the way on their journey, the kindness Aya and her family are met with is awe-inspiring. Yet, it is equally upsetting how much cruelty and ignorance they must overcome too. A superb read. What a wonderful story exploring the experience of an eleven-year-old girl fleeing conflict in Syria. Aya’s tale is told with such compassion - I wanted to reach into the pages and hug her! It took me on a real empathy journey and has left me with plenty to think about (and it also did make me cry more than once!). Aya also has a passion for ballet and she finds that her dancing is fundamental in her journey to find a way to process and express her experiences. This is an important A superb read. What a wonderful story exploring the experience of an eleven-year-old girl fleeing conflict in Syria. This is an important story that is so beautifully told with warmth and compassion. Wow. One of the best children's books I've read for a long time. This is the tale of Aya, an asylum-seeking ballet dancer who has escaped from war-torn Syria to England. There is a reasonable bit of ballet in it, but it should appeal to kids who aren't interested in ballet too as the main story is about how Aya's life has been changed from a regular girl enjoying regular things to that of a refugeee. It really tugs at the heart-strings and I cried my way through a fair bit of it. Very much recomm Wow. One of the best children's books I've read for a long time. I live just outside Bath with my husband, Jonny, and my two children (plus two toy monkeys, six goldfish and we’re hoping to get some chickens!). I teach English two days a week at a local secondary school. I also write articles for newspapers and magazines. Oh, and I write novels too!